Guam High School’s track and field team was more than ready to run. All one of them. Emma Sheedy, the Panthers senior, was the lone representative of Guam High competing in Friday’s 14th Alva W. “Mike” Petty Memorial Track and Field Meet at Okinawa’s Kubasaki High School. The meet is named for the late Mike Petty, the former Kubasaki athletics director and father of high school track and field on Okinawa who died of cancer 26 years ago. Sheedy didn’t come away from Okinawa from the results for which she had hoped. 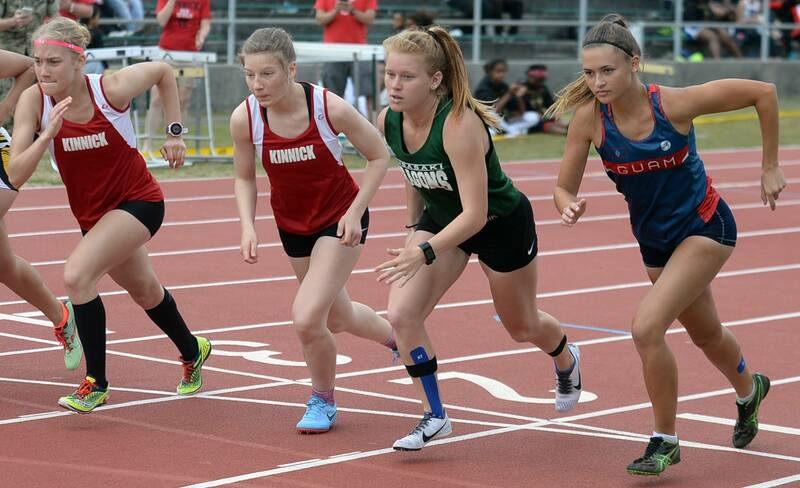 But the reigning island cross-country champion and last year’s island 400 and 800 champion, still felt good about her first track and field competition against DODEA Pacific athletes other than her own Panthers teammates. It was also the next-best thing she’ll ever come to competing in a DODEA Pacific Far East track meet. Due to a ruling handed down in the fall of 2014, schools on Guam are no longer invited to DODEA Pacific Far East sports events; they had been part of Far Easts dating back to boys basketball tournaments in the 1960s. Sheedy went up against a star-studded distance lineup that featured reigning Okinawa cross-country champion Elizabeth Joy of Kubasaki and Nile C. Kinnick’s distance triad of Erin Stonebarger, Rissa Eilmes and reigning DODEA Japan and DODEA Pacific Far East cross-country champion Taryn Cates-Beier. All five ran the 1,600-meter race, which after a couple of laps became a match race between Joy and Sheedy, with the latter leading most of the way until Joy blew past her on the far turn of the last lap. Joy clocked a personal-best 5:36.94, while Sheedy was next with 5:41.67. Cates-Beier was third in 5:51.91, then came Eilmes in 5:53.68 and Stonebarger in 5:59.57. Kubasaki’s Sophia Brown won the 400 in 1:05.65. Sheedy took third place in 1:06.20. In the 800, Joy clocked 2:30.24, followed by Cates-Beier (2:33.17), Stonebarger (2:34.79) and Sheedy (2:40.57). “It’s nice to know where I’m starting off my season,” Sheedy said of her other purpose for running at Mike Petty. Guam’s high school track and field season begins Friday at Guam High School’s Agana Heights campus.